In the Seven Faces of "The Peril" (2010), St. Louis Fed president Jim Bullard speculated on the prospect of the U.S. falling into a Japanese-style deflationary outcome. His analysis was built on an insight of Benhabib, Schmitt-Grohe, and Uribe (2001) in The Perils of Taylor Rules. These authors (BSU) showed that if monetary policy is conducted according to a Taylor rule, and if there is a zero lower bound (ZLB) on the nominal interest rate, then there are generally two steady-state equilibria. In one equilibrium--the "intended" outcome--the nominal interest rate and inflation rate are on target. In the other equilibrium--the "unintended" outcome--the nominal interest rate and inflation rate are below target--the economy is in a "liquidity trap." As BSU stress, the multiplicity of outcomes occurs even in economies where prices are perfectly flexible. All that is required are three (non-controversial) ingredients:  a Fisher equation;  a Taylor rule; and  a ZLB. Back in 2010, I didn't take this argument very seriously. In part it was because the so-called "unintended" outcome was more efficient than than the "intended" outcome (at least, in the version of the model with flexible prices). To put things another way, the Friedman rule turns out to be good policy in a wide class of models. But mostly, I figured that other factors were probably more important for explaining the events unfolding at that time. Well, maybe I was a bit too hasty. Let me share with you my tinkering with a simple OLG model (similar to the one I developed here.) Unfortunately, what follows is a bit on the wonkish side. If you catch any errors, or otherwise have any comments to make, please let me know. People live for two periods; they are "young" and then "old." Everyone only values consumption when old. Their objective is simply to maximize (expected) future consumption. The young are endowed with some output y. The are also each endowed with an investment technology such that k units of output invested today yields f(k) units of output tomorrow. Assume that f(k) is increasing and strictly concave; i.e., f'' < 0 < f'. Technically,  determines bond demand. In equilibrium, the supply of bonds (determined by policy) must equal the demand for bonds. Hence, by choosing b in this model, the government can choose the prevailing real rate of interest. Lump-sum taxes are simply adjusted by way of  to finance the carrying cost of the debt. Equilibrium consumption is then given by ; i.e., c = f(y-b) + b. The real GDP in this economy is given by Y = y + f(y-b). Notice that this model delivers a standard IS curve. That is, by increasing b, the government increases r, capital is crowded out, and output falls. Likewise, lowering the real interest rate stimulates (investment) demand, leading to an increase in output. with the demand for nominal bond holdings given by B = Pb. If I define r = R/ Π+ as the expected real rate of interest, then we see that  is equivalent to . so in a steady state with b = b+, we have t = (r-1)b, which is equivalent to . Consumption is given by . The model to this point is riddled with indeterminacy, even restricting attention to steady states. What determines the nominal interest rate, the inflation rate, the price level, etc.? Note that this indeterminacy is not present in the model with real debt. In that world, I assumed that b was a policy instrument. This (along with the lump-sum tax instrument) pins down an equilibrium. In the world I am describing now, the government does not pick b. It need not even pick B if, in particular, it is willing to let demand determine quantity at a given rate of interest. How to proceed? As usual, in small steps. We can think of B as interest-bearing money. The nominal interest rate on money is commonly assumed to be zero, so R = 1. But there is nothing that requires this to be the case; we are free to pick any interest rate supportable by taxes here. The key assumption is that R is determined and that it is constant over time. which is a first-order difference equation in real money balances. The model has two steady states. In one, b = 0; in the other, b > 0 satisfies f'(y - b) = (R/μ). It seems darn easy to construct the optimal policy here. Just set (R/μ) = r* and we're done. Well, not so fast. As it turns out, even for the case of a fixed stock of money B, there generally exists a continuum of nonstationary equilibria indexed by an initial condition 0 < b0 < y, with the time path for b asymptotically approaching zero; see Figure 1 in Woodford (1984). Of course, since P = B/b with B fixed, this implies that the price level approaches infinity (in fact, these are hyperinflation dynamics). Isn't it interesting to note that Friedman's k percent rule is dynamically unstable here? where Π* = μ (arbitrary), R* = r*Π*, and α = 1. 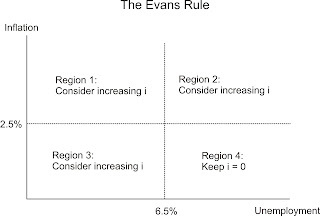 The policy rule  is a Taylor rule. The rule dictates that the policy rate be increased one-for-one with expected inflation. Such a policy keeps the expected real rate of interest pinned to its natural rate. As such, the economy is always at potential (this would not necessarily be the case if I was to introduce other shocks, of course). Note that the price level is now determined, P = B/b* with P+ = Π*P.
Would the ZLB restriction R ≥ 1 limit the ability of policy here? I do not think so. First, the problem in this model is a the possibility of a self-fulfilling hyperinflation -- deflationary equilibria do not exist. As such, policy only needs to threaten to raise, not lower, the nominal interest rate. Second, I believe that the optimal monetary policy may alternatively be expressed as a money growth rate that varies in proportion to the expected growth rate in real money demand. That is, targeting the inflation rate is feasible here (and contrary to Eagle (2006), an inflation target policy seems consistent with price level determinacy here). Following the approach taken in the New Keynesian literature, we might instead assume that the quantity of nominal debt B (money) is entirely demand-determined. The only policy instrument is R (and, of course, the lump-sum tax). I assume that policy follows the Taylor rule  with α = 1. As far as I can tell, all of the math developed in the previous section continues to hold. But giving up the quantity variable B as a policy instrument must have some implication. Indeed, it does. What we seem to lose is any fundamental economic force determining the price level and inflation rate. That is, the level of debt and its growth rate simply accommodate themselves to the prevailing price level and inflation rate, respectively. According to , exogenous movements in the expected rate of inflation (inflation shocks) are met one-for-one with movements in the nominal interest rate, leaving the real rate of interest pegged to its natural rate. Note something interesting here: the inflation target Π* is completely irrelevant. Inflation in this model can be whatever it "wants" to be. If the community expects an inflation rate Π+ < Π*, the inflation rate Π+ becomes a self-fulfilling expectation (and is hence a "rational expectation"). In this case, the monetary authority simply sets its policy rate R < R*. A situation like this can last indefinitely in this model. Imagine that the economy is initially operating at potential with Π+ = Π* (without loss). Then, out of the blue, individuals suddenly believe that the inflation rate is going to be permanently lower Π+ = Π' < Π*. Moreover, suppose that this inflation shock is sufficiently large to make the ZLB bind. What happens? What happens is that output drops permanently below potential (the economy continues to grow, however, at the rate implied by technological progress and population growth, both of which are normalized to zero here). Why does this happen? It happens (here) because the real rate of interest rises above its natural rate, r' = 1/Π' > r*. The real interest rate is too high. The effect is to depress (investment) demand, r' = f'(k') implies k' < k*. The real GDP falls below potential, Y' = y + f(k') < Y*. Because there is no nominal anchor for inflation in this economy, all sorts of bad things can happen at the lower bound. Contrary to the Friedman rule prescription, deflation is bad (generally, any inflation rate sufficiently low to make the ZLB bind). Not that the monetary authority could actually implement the Friedman rule if it wanted to. In this economy, the monetary authority has absolutely no control over the inflation rate! An obvious way to provide a nominal anchor (in the model) is to adopt the monetarist approach and control the supply of the monetary aggregate. But perhaps this is something that is difficult to do in reality. What then? Everything seems to hinge here on how individuals form inflation expectations. The theory here provides no guidance as to how these expectations should be formed. One can assert that individuals are likely to use the inflation target Π* as a nominal anchor. But this is just a bald-faced assertion. That is, if individuals do use Π* as a nominal anchor, then it will become a nominal anchor. The monetary authority, however, has no way enforcing the target Π* (unless it adopts a monetarist approach). where 0 ≤ ρ ≤ 1, δ≥ 0, and where ε represents an inflation shock (say, i.i.d. and zero mean). Students may recognize  as a type of Phillips curve. Actually, now that I stare at , I see that the δ > 0 opens up another source of indeterminacy. It may be possible, for example, that if people suddenly expect a recession Y+ < Y*, that the downward revision in inflation forecasts implied by  could make the ZLB bind, generating a self-fulfilling prophecy. Anyway, let's just set δ = 0 here. In the Wicksellian approach above, I adopted a special case of ; i.e., ρ = 1 and δ = 0;. But now, for 0 ≤ ρ < 1, any given inflation shock is mean-reverting (to the inflation target). The "lift off" date -- the date at which the monetary authority begins to raise its policy rate according to  depends on how quickly inflation expectations rise. The speed of adjustment here is governed by the parameter ρ--a lower ρ implies faster adjustment. Is there anything the monetary authority can do here to "talk up inflation" (i.e., lower ρ)? We really can't say without a theory of expectation formation. But it seems to me that "promising to keep R = 1 for an extended period of time" may have the effect of increasing ρ, extending the period of adjustment. That is, by postponing the "lift off" date, agents may rationally expect inflation to remain below target for a longer period of time. Nevertheless, I think it is interesting to explore what potential effects future downward revisions to inflation expectations may have on the economy at the ZLB. In the Wicksellian regime I study above, there appears to be no nominal anchor apart from what agents believe it to be. And if agents come to believe in a persistent deflation, it may come to pass, and the economy may be stuck below potential for a very long time. Convincing agents that the nominal interest rate is likely to remain at zero for a long time may be counterproductive, depending on how individuals interpret such policy announcements. I want to stress, however, that while getting inflation and inflation expectations back to target (and firmly anchored to target) may be a solution to one problem, it is unlikely to be a solution to every problem currently facing the U.S. economy. To put it another way, suppose that the current real interest rate of -1% is too high relative to the current "natural" rate of -x%. Somehow driving the real return on bonds to -x% may then help things a bit, but it does nothing to address the more pressing question of why the "natural" rate is so low to begin with. You have likely heard of Mohamed El-Erian, one of the heads at PIMCO. Let's just say that El-Erian and other major bond investors pay a lot of attention to the conduct of Fed policy and how it's likely to evolve over time. Here is what El-Erian has to say about the Fed's most recent (Dec 12, 2012) policy statement: How Risky is the Fed's Major Move? Wow! That is what I suspect many investors said when they heard Wednesday's policy announcement from the Federal Reserve. First, it added to its expected purchases of market securities, doubling the dollar amount to $1 trillion for 2013 -- a very large number by any measure. Second, the Fed shifted to quantitative (unemployment and inflation) targets for forward policy guidance, and it did so earlier than most expected given theoretical and practical complexities. Maybe a lot of investors, including El-Erian (and myself, for that matter), were surprised by the Fed's move. But I can point to at least one economist who hit the nail right on the head; see, Steve Williamson. What you should expect to see is a QE4 program involving purchases of $40 billion in MBS per month and $45 billion in long Treasuries per month. To support a stronger economic recovery and to help ensure that inflation, over time, is at the rate most consistent with its dual mandate, the Committee will continue purchasing additional agency mortgage-backed securities at a pace of $40 billion per month. The Committee also will purchase longer-term Treasury securities after its program to extend the average maturity of its holdings of Treasury securities is completed at the end of the year, initially at a pace of $45 billion per month. The triggers for liftoff typically take the following form. The policy rate should stay at 0.25% until one of two things happen: (i) the inflation rate rises above x%; (ii) the unemployment rate falls below y%. Most of the public debate currently seems to be over what x and y should be. x is typically in the range 2.5 to 3.0, and y is typically 5.5 to 7.0. The x in part (i) turned out to be 2.5%, which fell within his predicted range of 2.5-3.0; and the y in part (ii) turned out to be 6.5%, which fell within his predicted range of 5.5-7.0. Steve didn't quite nail it exactly, however (as he explains in his follow up piece here). In particular, note that the y = 6.5% is not really a "trigger,"--it is just a necessary (but not sufficient) condition for raising the federal funds rate target. What it really means is that the Fed does not plan to "tighten" as long as unemployment remains above 6.5% (and as long as forecast inflation remains below 2.5%). But the Fed may wish to keep the federal funds rate low even if unemployment falls below that threshold. In any case, I just thought I'd point this out for those people interested in following the Fed: Steve Williamson is your man. Spread the word.